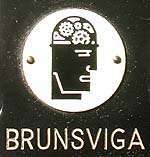 Brunsviga logo on this calculator. 6-digit setting register, 10-digit accumulator register, 5-digit revolutions register. This model was made in Germany from 1932 to 1945. 230 x 190 x 95 mm (9.0" x 7.5" x 3.75"), when the rear support is folded up, about 3 Kg (7 lbs). At first sight this appears to be a pinwheel calculator of the Odhner type, and I was fooled till told otherwise and explored inside. The machine in fact utilises a modified form of stepped gear mechanism arranged to give a very compact layout - see photographs below. 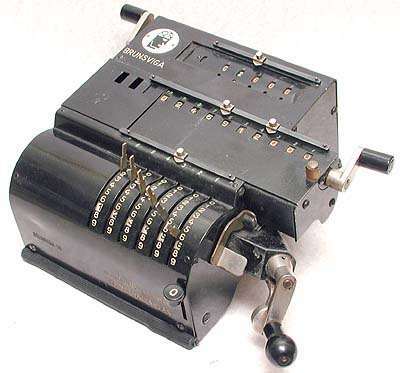 The giveaway that it is not a pinwheel mechanism is that the setting lever assembly does not revolve when the crank handle is turned, see the Odhner calculator. Manufactured by the firm of Grimme, Natalis and Company A. G. of Braunschweig, Germany, which acquired the patents of the Original Odhner in 1892. 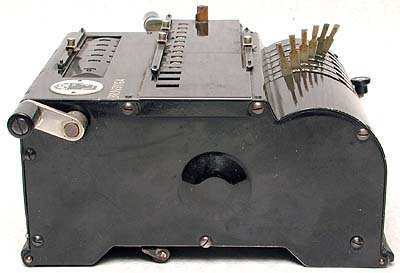 It manufactured and improved the pinwheel calculator and sold it under the name Brunsviga. The usual arrangement of machines of the pinwheel type, as in the Odhner, is to have the setting register at the top of the machine, with the accumulator and the revolution counter side by side below. In this machine, with the stepped gear mechanism, the width is greatly reduced by placing the three registers above each other, with the setting register at the bottom, the accumulator above it (and able to be indexed sideways), and the revolution counter above that. Brunsviga produced updated models with this arrangement up to the 1970s. On this model a support plate at the rear folds down to tilt the machine forwards and present the controls to the operator at a better angle. With this support plate folded up to give a height of only 95mm (3.75") the machine is small enough to fit in a decent sized brief case, though is still fairly heavy at about 3Kg (7 lbs). In modern parlance it would be described as "luggable". A support plate at the rear has been folded down to tilt the machine forwards to make it easier to operate. With the rear support plate folded up underneath, the size of the Brunsviga 10 is minimised. It will now fit in a brief case. 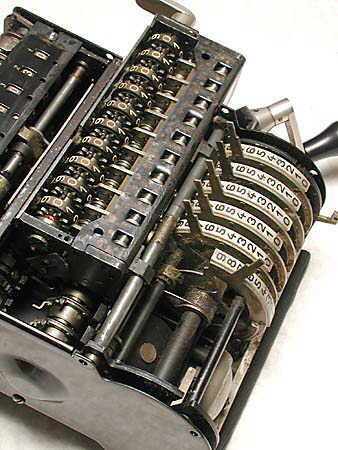 With the covers removed, showing the mechanism. 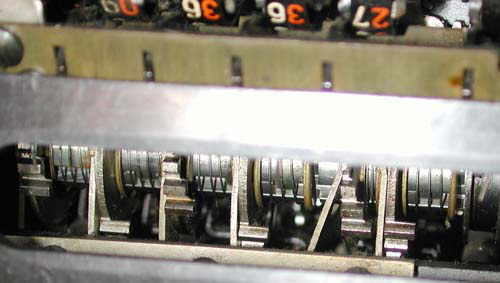 Although with the covers on the setting levers appear to be part of a pinwheel calculator, removing the covers reveals a different mechanism. 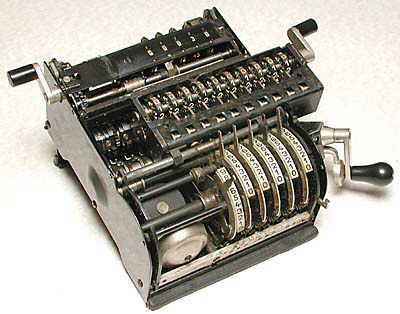 Compare with the pinwheel mechanism in the Odhner calculator. Moving a setting lever causes a linkage at the bottom to shift a stepped gear sideways, see photographs below. Looking from the rear with the cover off, the stepped gears can be seen. 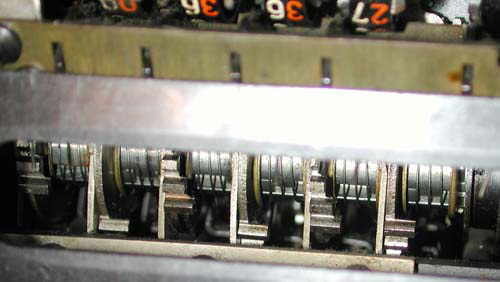 Each gear is moved sideways when it's setting lever is moved, as shown in the photograph below, so that it engages a different number of teeth with the gear in the accumulator register. When the crank handle is turned the accumulator in each position is advanced by the number of teeth engaging. So, when a setting lever is set to 1, it's linked stepped gear moves to the right and engages 1 tooth with the corresponding accumulator gear. Lever set to 2 moves the gear to engage 2 teeth, etc. To make the machine more compact the stepped gears have a maximum of 4 teeth only. Then when the setting lever is moved from 4 to 5 the stepped gear moves back to the left to the zero-teeth-engaged position, but another full gear wheel is moved into the train which always advances the accumulator by 5 when the crank is turned. Now, when the setting lever is moved to 6 the stepped gear engages by 1 tooth and the full gear again advances the accumulator by 5. Continuing in this way the accumulator can be caused to advance by up to 9 in any position for one revolution of the crank. These full gears are deep inside the mechanism and are very difficult to see. The setting lever connected to the second stepped gear from the right has been set to 4. The mechanism can be seen to have pushed the stepped gear to the right so that 4 teeth will engage with the accumulator mechanism for this position. Moving the setting lever to 5 will cause the stepped gear to move fully to the left, so that none of its teeth will engage the accumulator mechanism, and will also cause a full gear, out of sight, to move into position where it will cause the accumulator to be advanced by 5. 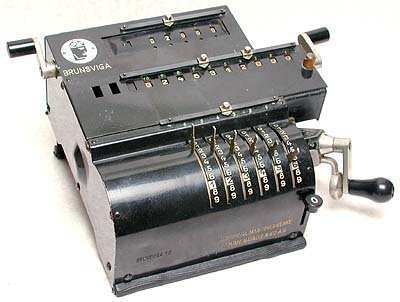 For further information on Brunsviga calculators see the mechanical calculator site of Herbert Schneemann and Walter Szrek.